Apply the Stripper/sealer remover with a roller. I have tried many different garden sprayers to apply it and have always ran into the problem with them clogging after a little use. Old fashion roller and paint tray should work just fine. After applying let the solution sit for about 15 minutes before proceeding with the next step. 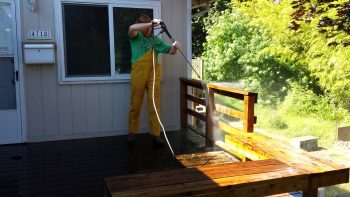 Start Your Pressure Washer and begin to wash away the old stain and sealer. Tip: Make fast and swift movements, pausing with pressure washer wand can leave marks in the wood. Tip: Wash off debris from surroundings as you go, they will dry onto the surfaces around you. 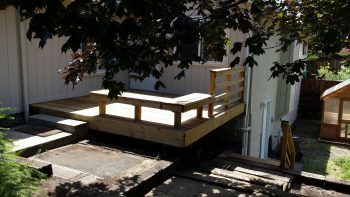 Tip: Hand Rails typically don’t need stripper to remove old sealer/stain. Apply wood brightener with roller, same as stripper. Let solution absorb into the wood. Hose off. 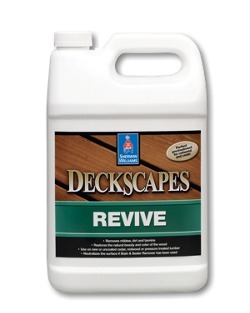 Let Deck or patio dry. A minimum of 24 hours, We recommend at least 48 hours. Drying allows for the wood pores to open, that way absorbing the maximum amount of stain or sealer. Select a color for your stain. 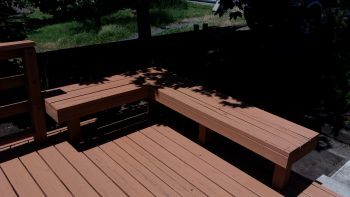 Depending on the condition of your deck there are a few different choices when it come to selecting the type of finish your stain/covering will have. Fully transparent Oil based stains have a good wood penetration ability but lack the ability to cover dark spots and other imperfections in the wood surface. A semi transparent sealer will cover most imperfections in the wood and a oil based semi-transparent stain is a great alternative to fully transparent stain. Semi-transparent stain will still leave some of the wood grain visible. 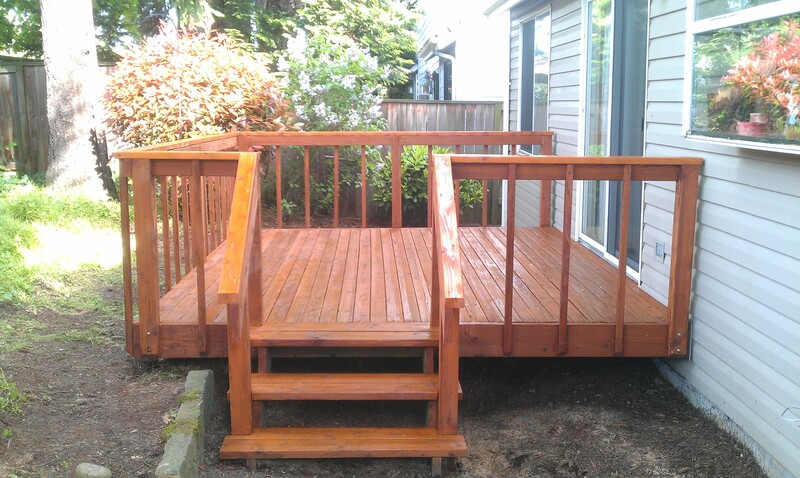 A solid color stain is the best way to if you have a deck that gets a lot of element abuse. 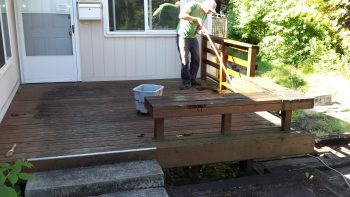 A solid stain also comes in a oil based stain and is a great way to hide vertically all imperfection while still leaving a feel of the wood grain.Tip: Lightly sand your deck with a medium grain sanding sponge, to remove any standing fibers.